Individual contact-specific data can be exported out of Reel-Scout™ version 10 for use in a variety of other applications, such as mail merges, label printing, and reports. Before you export a contact or a set of contacts, search for the contacts that you want to export. For more information, see Browsing Contacts and Looking Up a Specific Contact. 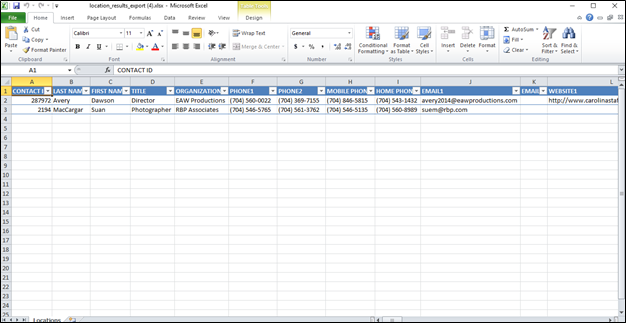 Once you have found the contacts that you want to export, click the Export to Excel Worksheet link on the Browse Contacts page. Once you have clicked the Export to Excel Worksheet link, RS10 will open a dialog box that will require you to choose if you want to export only your search results or all of the contacts in your database. Click the appropriate selection. The download will begin automatically. Once it is complete, you can open the Excel spreadsheet. The columns are preformatted and self-explanatory. You may now click the Close button in the Contact Export dialog box.